We are pleased to announce that we will build an amazing new playground for Paterson School #27 in Paterson, NJ on October 25, 2014. We are working together with the community of Paterson, The NJ Community Development Corporation and KaBOOM! to bring this playground to life. 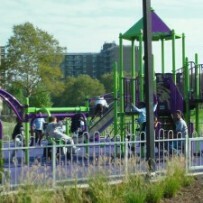 This new playground will be the only one within a half a mile radius. It will be open to the public and reach 1200 children and their families annually. The average household income in the community is $32,000 and 90% of its children are on a free or subsidized lunch program at school. This playground will be an extremely welcome addition to this deserving community and we are thrilled to be able to give them this gift of play! A big thank you to Liam, Audrey, Griffin and Isla Patterson who have provided an extremely generous donation towards this playground build. We look forward to building this playground together with them.